Today I had TD tracks eat 750+ dmg shell and it HAPPENS all the time with all kinds of caliber guns. Modules just acting like sci-fi shields and absorbing 100% dmg. Does anyone else think that much more logical and healthier would be if module absorbs as much dmg as much health it has, and the rest of dmg is transferred from vehicle remaining health? Or game should have some kind of "overmatching" mechanic for high caliber guns, so when dmg vastly exceeded module health, the vehicle itself should also take damage. This is also one of the reasons why everyone hates cars. Not the speed, not the accuracy on the move, but the goddamn wheels that act as shields and constantly absorb 100% dmg. This is same with any vehicle but it's just most apparent with cars because it's much easier to "accidentally" hit their wheel and not the hull (my EBR 75 says hello). Stuff like that is just heartbreaking. the tracks in this game are made with dark magic that protect the tank. you need a golden shells to get past the magic barrier. yes i noticed the OP shot APCR but its just for the sake of story. Edited by The_Naa, 10 April 2019 - 09:24 PM. Watching the vid, how long you aimed and the shell type you fired, make it far more likely you failed to hit the tank properly and hit a part of the tracks that had no tank body behind it. A properly aimed shot which hit at the correct height should've damaged that tank just fine, but your aiming circle was huge, that shot could've as easily hit the ground. You aimed in Russian tank...your fault. Go grind some tanks from tier 1 upwards on a standard account with no crew retraining and no free XP to unlock the best modules until you get to tier 4. I just lost 7 games in a row playing stock tier 4s against the stupidly OP tier 4 tanks like Hetzers and Matildas, tier 5's like the KV-1 and KV-220-2 and even some games against tier 6 monsters like the O-I. I used a few premium rounds when my normal ammo won't even pen the rear of an enemy tank and I still had bounces with prem ammo on tier 3 tanks. Absolutely ridiculous. How the heck do new players ever stay with the game once they reach tier 4? Actually, that might not even be frustration - I think it's just insanity. Edited by krazypenguin, 10 April 2019 - 08:16 PM. The other side of the coin would be, that how rage-inducing it would be if your enemy would be guaranteed to damage you when you're grazed on a sliver of a track or tip of the gun barrel. Yes, this is really annoying, but remember, every time you eat a shell with your tracks or only lose your tracks and don't sustain HP damage, the one who fired the shell is actually saying the same things as you did. Yes, shell eating tracks can really drive you nuts, but it happens to others just as much as it happens to you. So, no point in getting annoyed too much about it. Since you seem most annoyed that this happens when you fire big alpha shells, then I suggest you fire HE, those almos always do damage and nothing can save the enemy tank. Hence the reason Type 4s and Type 5s or FV4005s have been driving players up the wall for a long time now, that WG actually decided to do something about them. This is a clear example of a not fully aimed shot. Your shell is only guaranteed to hit somewhere in the aiming circle. It could have missed the T28 Prot completely. In this case it just hit the tracks without a part of hull behind it. A typical example of why super-fast aiming or fast turning tanks are actually causing frustration: you've no longer the time to properly aim your shots and have to take chancy snapshots. This applies most to older vehicles that are using older balance numbers. Edited by Anymn, 10 April 2019 - 09:12 PM. It doesn't work how you think it works. Modules do not absorb damage. That simply does not happen. Shells have two damage values, one vs modules, one vs tank hitpoints. If the shell hits a module then the module hitpoints are taken into account for damage to the module. The tank hp hitpoint value is only used if you hit and penetrate the "damage model" - i.e. hull or turret. This is what happened. You aimed with a circle three times the height of the tank you were aiming at. Most of the circle was filled with air. You were lucky even to hit the tracks. The tracks didn't eat the damage, the dirt under the tank took it all. So basically... be like WT. As they go on modules first too as such. Then again if they did that, the Saving Throw mechanic needs to be reworked too. This doesn't matter. I am just saying that modules should not stop shells from penetrating the "damage model" of the tank. 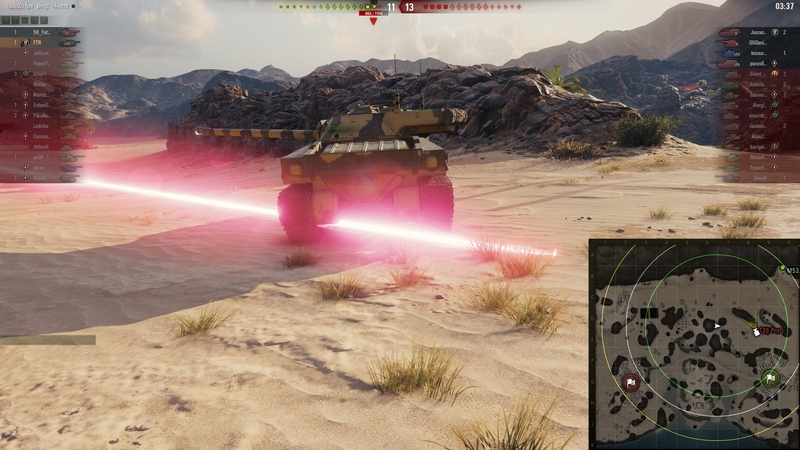 Like, firing a huge 152mm shell at side of the tank and hitting the track, should not stop vehicle from being damaged and it happens often, even with fully aimed shots where I clearly hit the track on the side of the enemy tank and do 0 damage because of 10mm tracks. But you are right, thing above because this was just an example, or more like showcase of [edited]rng mixed with my frustration. I am fully aware this was not fully aimed shot and it was not supposed to be fully aimed shot. I recently played T28 proto a lot so I know more or less how much time it takes for him to fully aim so I took as much time as I possibly could to aim without getting myself shot. Here is a screenshot with a shell tracer I managed to take after watching the replay again in 1/16 speed with freecamera mod. Curse you, lucky T28 Proto driver. Edited by FTR, 10 April 2019 - 10:43 PM. I don't know why you think that ought to do damage. You didn't read my post. Happens to me all the time. Once I searched for "Track Magnets" in the equipment list for 2 hours straight and got myself wondering why I exist then I drank tea and moved on. It doesn't. Not if you have enough penetration to go through both the tracks and the hull, and the air space if you are using HEAT, and you actually hit the hull. It just does not happen. Besides the comment you edited in that made the intent of your post clearer, I'm still not sure why you're posting a screenshot of a shell that clearly misses the tank body, while in the same post repeating the false statement that tracks eat your APCR shells. Whether or not it should absorb some of the damage and then transfer it to HP is just a design choice. There's a tradeoff to it, if you have to put up with less [edited], so do the enemies. The problem is how you perceive the expected result and randomness. The game is very discrete - it has rules, it rolls for accuracy, and then has set of rules on whether or not you deal damage. Problem is, humans aren't all that discrete, and everybody is subject to every single bias out there, and emotional reactions. You get frustrated on a roll of a dice - that's natural. But the dice doesn't care, and it doesn't do "should" or "close enough". If you have a feeling that something "should" hit, or "should" take damage, or you deserve something, let go of that feeling. RNG is brutal, and works on a very specific rules of a game. It damages, or it doesn't, and there are set parameters that it operates under. The game doesn't follow analog world, and there's no benevolent dungeon master here that reads the situation and says that hey - you rolled something close enough and it sorta would make sense that this would be a kill. If you play a game that displays you your chances of performing successful actions, it's really (really) easy to think that "95%" means guaranteed success. Hey, maybe even 90%. 80% is success four out of five times, so it's easy to make a shortcut in your brain that says "do this, and you'll succeed". But you don't. Maybe you'll fail on your first, maybe on your tenth time. But you roll and roll and roll, and then you fail. And then you get frustrated because you feel something was denied from you, and feel the need to blame something. We just don't operate in the same world as code does. There's no justice, there's no nudging of rules to give a sensible result, there's no catering to whatever human brain considers reality and sensible result. There's just brutal crunching of unforgiving numbers and only trues and falses based on a function that generates random results without any care on your previous experience, state of emotions or perception of what's right or wrong when it comes to gameplay. Every game is like this. Nobody is out to get you. Welcome to the digital world with your analog brain, that's still figuring out what the hell just happened over a single generation.